King Soopers is a brand of Kroger. Browse the latest deals of King Soopers Ad for mix and match sales, digital coupons, event savings, fuel points, card deals, rewards, cash backs etc. In other words, they have very similar deals to Kroger ads. Usually, it’s possible to find a deal from departments of the bakery, general grocery, snacks, frozen foods, meat, deli, seafood, and more. Redeem the coupons to get multiple amounts of products at cheaper prices. Use some coupons more than once or twice. King Soopers operates in the Rocky Mountains. It’s a subsidiary of Kroger Supermarkets. General supermarket products are available in all of the weekly ads of this store. Subscribe to the King Soopers Weekly Ad for emails about future deals. 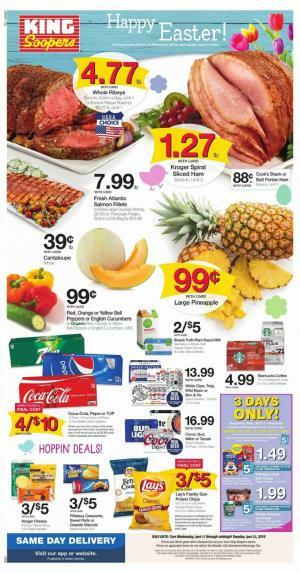 King Soopers Ad offers nice prices of weekly needs including meat, fresh produce, snacks, breakfast foods, and more. Buy breakfast foods like cereals saving $1 on each item when you buy 5. General Mills or Quaker cereal will cost $1.99 at King Soopers. Shop 4-days only sale items. Noosa Yoghurt or Yoghurt mates are 4/$5 only. Enjoy the ready meals at King Soopers. Home chef offers of home cooking look great. Take a look at the mix and match sale to find General Mills or Quaker cereal at $1.99. The price is effective when you purchase 5 participating items of the mix and match sale. Buy favorite packaged-meat products like Eckrich Sausage links, grillers, rope or Smok-Ys which is a 3x fuel point. Save with the deals of 4 days. Noosa yoghurt, LaCroix, Kettle brand potato chips are some of the deals from that range.